No other mode of transportation is more authentic to Cody Yellowstone Country than astride a horse. Whether with a group at a guest or dude ranch or with one of the area’s horse riding concessionaires, you will truly enjoy the experience of reliving life in the rugged west. You and your horse — no cowboy bond is greater. most Guest Ranches offer horseback riding for not only their guests, but anyone who is interested. For further information please see the Guest and Dude Ranches listings. There are several local hunting outfitters that also offer horseback riding. Contact Cody Country Outfitters and Guides Association at 307.587.2051 or visit www.codycountryoutfitters.com for further information. 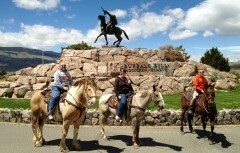 One hour historic trail rides leave from the Buffalo Bill Center of the West and circle down by the Shoshone River. Pony rides are available in a pen for children. 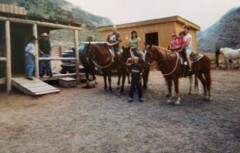 Open: June-August, daily, 9am-5pm One hour trail ride $40/person Pony ride $20/child Call for group rates.